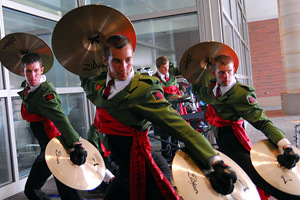 The Indiana Convention Center resonated Wednesday, Aug. 5, 2009 with the sights and sounds of drum corps. With more than 200 solo and ensemble performances scheduled over a span of six hours, corps members, family members and other fans were able to take in a wide variety of musical and visual presentations showing off the best talent DCI corps have to offer. 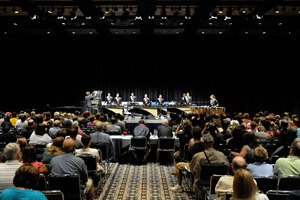 In addition to the competition, the convention center was abuzz with other activities including the annual fastest drummer competition which drew cheers from the audience whenever a competitor threatened the record. Also right in the middle of the action, SportClips was on hand to give corps members a clean cut as they get set to take the stage in front of thousands of fans this week at the World Championships. Max Logan is a mellophone player with Oregon Crusaders who enthusiastically commented on the Individual & Ensemble event, saying, "I love it. It's an amazing opportunity to see other people from other corps perform outside the competitive intensity of drum corps. Although this is also competitive, it's more relaxed and we can learn from watching others perform." Yuchan Pan, a trumpet player for Oregon Crusaders, said, "There's talent in every corps. This event is a great opportunity that gives everyone a chance to show off their talent." Haley Hill and Samantha Wetzeo are Racine Scouts color guard members who performed a flag duet together. "Getting to show everyone what individuals are capable of doing is exciting," Wetzeo said. Hill added, "It was exciting to work with my best friend." Laurie McGinn of Tempe, Ariz. is the parent of Brian (tuba) and Becky McGinn (front ensemble) of the Academy. She noted, "Everyone in the audience was really into it. It was a fun atmosphere. This is a great day because it gives the kids a chance to shine, to show off their skills." DCI judge Michael Rubino adjudicated trombones, baritones and French horns at the event. He heard a performance he'll never forget. "I saw one of the best performances I ever saw at this competition, a French horn player from the Boston Crusaders who was spectacular. If I had known she was going to be that good, I would have recorded it." He further observed, "I think the kids are coming in better prepared. I love doing this because I get a chance to talk with them and help them out." 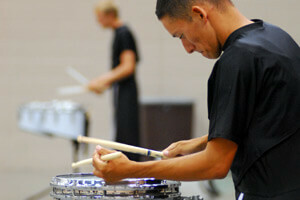 Judge Jeff Prosperie was in charge of judging the snare and timpani entrants. He noticed that over the past few years, "The compositional construction of the solos have evolved in terms of pacing, creativity, color and effect." Scott Johnson, director of percussion for the Blue Devils, said he firmly believes in the positive influence of the Individual & Ensemble competition. "I did 'individuals' each of the four years I marched as a member of the Blue Devils. It helped my creativity, stimulating my imagination as a drummer. I think it's healthy. It's great the performers can go out there and be themselves." Contributors: Johnny Gilbert, Peter Mitchell, Sid & Linda Unser.